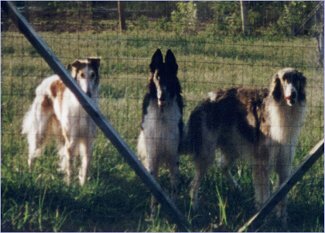 Gryffyn's Aeyrie is a small, non-commercial kennel, which began in 1992 (although I didn't really know it at the time) when I brought my first Borzoi, Nikki into my home in Houston, Texas. I became thoroughly hooked on the breed thanks to this wonderful girl who became my foundation and gave me some lovely progeny to go on from. A few months later, Luke was acquired - and through his former owner, I was introduced to dog shows and became hooked. I moved to Alvin, TX, just south of Houston, several months later. Nikki and Luke stayed at my parents' home while I was getting fence up at the new home, and they were inadvertantly bred, resulting in my first litter. From this litter came my first homebred champion (Freddi), with the rest being placed in primarily companion homes (the priority being finding loving homes regardless of any interest in showing). While in Alvin, the Arthurian litter was born (March 1998) and I have never looked back. From this litter came 3 AKC champions, 2 UCI/IABCA International champions, and the top LGRA Borzoi for the year 2000. When the Arthurian pups were 10 months old, I moved to the Dallas, TX area to join with my fiance, and fellow Borzoi enthusiast, Victor Whitlock (Viktor Borzoi). Our first co-bred Borzoi litter together was the Sword litter. Together we also indulged our interest in the Silken Windhound breed beginning in 2001 and found them to be as irresistible as Borzoi, and we bred our first Silken litter in early 2003. In 2003, Victor decided to discontinue breeding under his kennel prefix of Viktor and join me in breeding under the Gryffyn's Aeyrie name. We have been pleased with our breedings, and have also added some promising Borzoi from outside kennels, including Borscana, Chataqua, Nickolai, Promise, Rising Star and Wyvern. Both Victor and my original stock came mostly from Chataqua, with Nikki bringing in the bloodlines of Rabrega (which also feature prominently behind the Wyvern line). Through outside breedings we have added Teine and Kyrov lines. Our Silken Windhound foundation comes from Kristull (whose bloodlines may also be found generations back in our Borzoi). Our goals are to breed Borzoi and Silken Windhounds that are not only beautiful and elegant, but functional as well. We are aiming to produce dogs that can perform both on the field and in the ring - feeling that either arena should not exclude the other. Soundness, type, temperament and health are taken into consideration for each litter and for any acquisitions. We prefer to wait until dogs are 4-5 years of age before breeding and we have also performed some health testing on our dogs, including OFA Thyroid, OFA Heart and CERF eye exams/certifications. We also want a Borzoi or Silken that will excel in being a loving companion. We are active in many facets of the dog fancy. We participate with our dogs in conformation showing (AKC, UKC, Rarities/NAKC and IABCA, and occasionally dogs shown in Canada and Mexico), lure coursing (AKC and ASFA), straight racing (LGRA), oval racing (NOTRA), and have also trained dogs for obedience and agility competition. We have had nationally ranked dogs within the majority of these venues over the years, including top 25, top 5, and even #1. We are current or past members of several organizations: Borzoi Club of America, Lone Star Borzoi Club, Gazehounds in Texas, Houston Area Hound Association (past, Lynn), Rocky Mountain Borzoi Club (past, Lynn), Greater Collin Kennel Club (past, Victor) and the International Silken Windhound Society. We also hold (or have held) board or officer positions within most of those organizations. We also have worked in assisting rescue in both breeds. We enjoy giving back to the Borzoi and Silken communities with our support and volunteer efforts. All pups are sold with a written contract and pet pups also with a spay/neuter agreement. An example of my basic contract may be found within the Resource Library section of this website.